Open-hearted +++ Boquerones +++ Málaga, Spain +++ Absolutely Intercultural 233 +++ – absolutely intercultural! 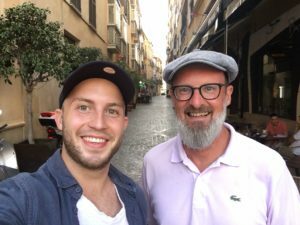 In our first category “absolutely open-hearted “, Julian, who is a German exchange student at our partner university, Universidad de Málaga, in Spain, will share his first experiences with red traffic lights in Málaga and a different greeting style he noticed when he met the mother of his Spanish roommate for the first time. In our second category “absolutely special” Juanjo an Erasmus Student from Spain, who is currently studying a semester at RheinAhrCampus in Germany, will talk about the differences he noticed in the educational systems of Germany and Spain. In our last category “absolutely mobile” Trish, who is originally from Ireland but lived in various different countries and now lives in Malaga, will share with us why she decided to live in Spain. Thank you all who joined us for today’s show. If you liked our show, please like us on Facebook, too. By the way, did you know that we are also on iTunes? You can subscribe to us there for free and give us a rating and a comment. We would appreciate that!